The RD-C Series gearhead is a high-precision hollow shaft gearhead for servo motors of 100W to 4.9KW. The RD-C gearhead provides extreme precision and high performance in a very compact, ready-to-mount package. This hollow shaft series allows the routing of cables, pipe, or hoses through the body of the reduction gear for those applications where space is at a premium. This series features less than 1 arc-min of backlash, and the availability of high ratios (up to 185:1) with a single gearbox size. Despite the compact package, this unit provides high torsional rigidity, and the torque capacity to handle up to five times the rated torque for emergency stops. 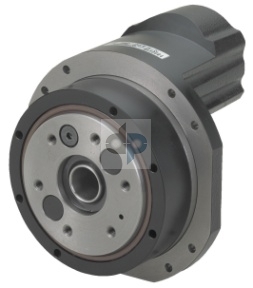 This reducer features a crankshaft that is supported on both ends by large angular ball bearings to provide large moment capacities, eliminating external support devices and simplifying installation. All NEMA and Metric motor mounting sizes are available. The RD-E gearhead is sealed completely for shipping (pre-greased), along with the motor shaft coupling and motor adapter plate customized for your specific servo motor for easy installation.